The Blue Ash Airport was Ohio's first municipal airport. Opened in 1921, it served the Greater Cincinnati area for over 91 years until service ended in 2012. 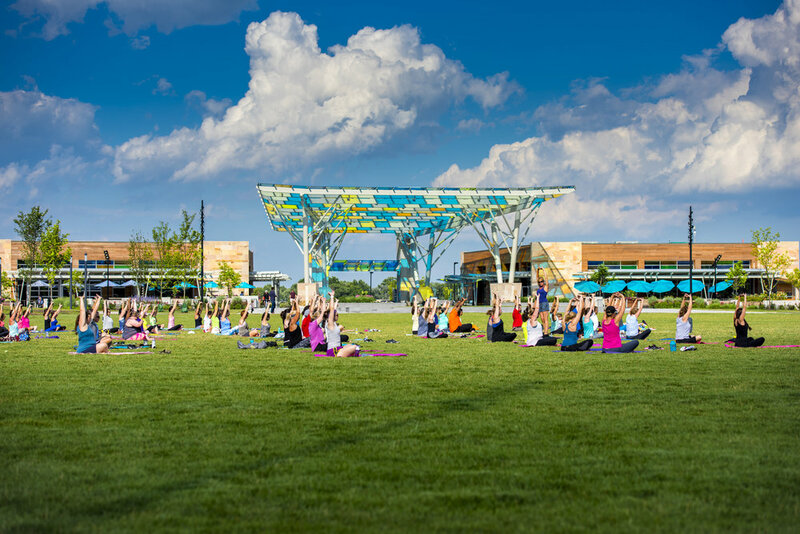 With the airport closure, the City of Blue Ash saw the potential for a catalytic project at the site - a new, world-class park anchoring a mixed use district. For over a decade, MKSK has worked with the City on conceptual design, and over the past six years, a team including MSA Architects and KZF Design has been working to bring the concept to life. The result is Summit Park. The 130-acre park support a wide array of programming and amenities centered on musical events, dining, and entertainment. The 1.5 acre playscape is designed to serve kids from ages 2 to 102 and acts as the park’s strongest daily draw. The playground is closely linked to the adjacent outdoor pavilion and associated restaurants and cafes. It is fully accessible and accommodates users across a broad spectrum of abilities. The park’s “second tier” features a rainwater harvesting pond to collect and filter stormwater run-off from the park’s drives and parking areas. Harvested rainwater is used to irrigate the Park Commons and Great Lawn and reduce annual costs for lawn maintenance. A restored stream corridor has created new habitat in over 12 different types of habitat zones and employs low impact construction techniques to establish a highly diverse stream ecology. The park is serving as a catalyst for significant new investment throughout the city and will anchor a walkable, 110-acre mixed use neighborhood which MKSK has master planned on behalf of the development partners to blend seamlessly into the park. The $350 million development is positioned to be the Greater Cincinnati region's premier office and workplace destination with Phase I scheduled to open in 2019.